LEN - www.lankaenews.com | Hooligan monk Gnanassara released on bail! He respected the ‘jumper’ more than the sacred robe-so did not come to court ! 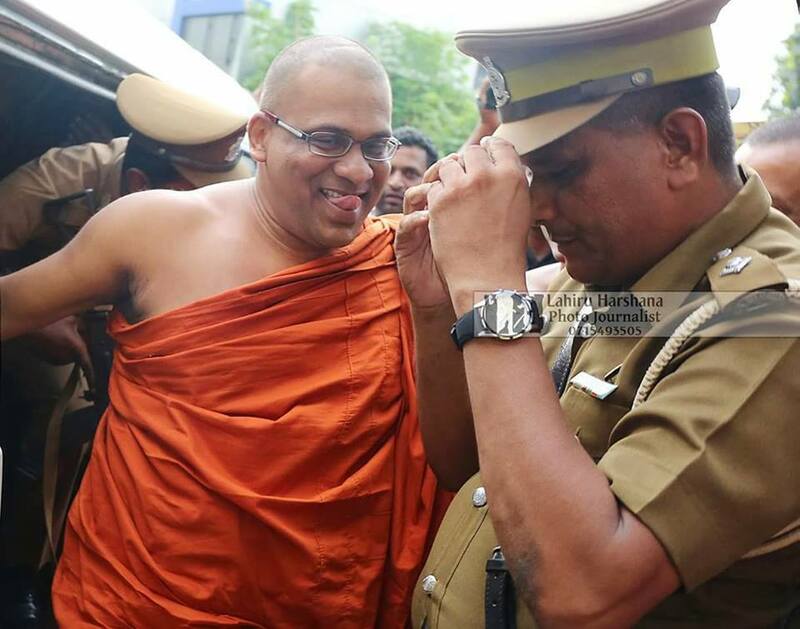 (Lanka e News – 24.June.2018, 11.00PM) Gnanassara the robed hooligan monk who was jailed for rowdy behavior and was wearing the ‘jumper’, following the appeal filed by him was granted bail on the 22nd until the verdict is delivered on his appeal. Under the laws he must request bail from the magistrate court that sentenced him to jail. The magistrate Udesh Ranatunge who released him on two personal sureties in sums of Rs. 500,000.00 each also ordered that his passport be impounded. Because Gnanassara has to be in the ‘jumper’ until he is granted bail, Gnanassara on the first occasion did not appear in court. However since he had to sign the bail bond , after the Homagama magistrate court registrar by a fax message informed the Welikade prison authority , Gnanassara was brought to court. When he was released on bail , again after wearing the saffron robe he paraded proudly as Galagoda Athe Gnanassara Thera. For how long will he respect the sacred robe is the question on everybody’s lips.